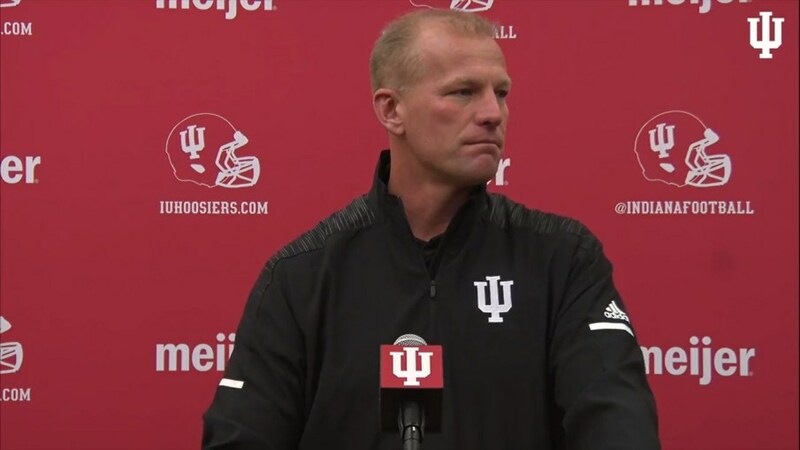 It’s time to get to know IU’s new offensive coordinator, Kalen DeBoer. Over the next few days, we’ll try to answer three questions: (1) What does DeBoer’s offense look like? (2) How will IU’s current personnel fit in that offense? (3) Please Jeebus, tell me it will be better than the last guy with the very similar name’s offense (not really a question, but ok). Today, we’ll start with a description of DeBoer’s offense, based on a review of a handful of games he’s called over the past few seasons. (3) 2017 Fresno St. vs. San Diego St. I thought it was important to watch more than just the last two seasons at Fresno State because the head coach at Fresno is Jeff Tedford, who has an offensive background. [ref] “Important” is a relative term. Honestly, as I watched EMU vs. Wyoming on my laptop at 6am on a snowy January morning, I asked myself if this is rockbottom for a college football addict. For my family’s sake, I hope the answer is yes. [/ref] Specifically, Tedford is regarded as something of a QB guru from his 11-season tenure as head coach at Cal[ref] See Rodgers, Aaron. [/ref], and even before that when he worked as the OC at Fresno St. (1993-1997) and Oregon (1998-2001). Tedford is also known as a West Coast offense guy, which means he likes to utilize short passes, with an emphasis on timing, and regular use of tight ends and running backs in the passing game. [ref] Think of the 49ers in the 80s and 90s. [/ref] By watching DeBoer’s offense before Tedford, I was trying to tease out what of the Fresno St. offense in 2017 and 2018 was Tedford and what was DeBoer. That said, even if DeBoer was operating an offense for the past two seasons under heavy guidance from Tedford, that may simply mean that DeBoer has added to his offensive repertoire, and IU will be the beneficiary of this expanded knowledge base. And of course, watching five games does not paint the full picture of who DeBoer is as an OC. This is just a snapshot, designed to provide IU football fans with a general idea of what to expect in 2019, as compared to what we have seen the past few seasons under Mike DeBord and before that under Kevin Wilson. From a personnel grouping standpoint, “11” was the most common[ref] 1 RB, 1 TE, 3 WRs. [/ref], 12 was next[ref] One back, 2 TEs, 2 WRs[/ref], and 13 was used occasionally. He seemed to use 2 and 3 TE sets more at Fresno State than he did at EMU, but at both programs, there was always a tight end on the field. He also used two-back sets, 21 or 22, a few times a game, generally in a split-back formation in the shotgun. The insistence on keeping a tight end on the field at all times is reminiscent of Coach Wilson. DeBord was similar but especially this past year, he went to 10 personnel quite a bit[ref] 4 wideouts, 1 back and no tight end. [/ref], at least in part because the receiving corps was so deep. Unfortunately, the offense became more than a little predictable because DeBord almost always passed out of 10. Aside from split-back, the formations varied with the location of the tight end. This is similar to what we have seen from DeBord and Wilson. The tight end will rotate between the traditional spot outside the tackle, to more of an H-back position a yard or two behind the line, to in the slot or out wide. DeBoer also utilizes the pistol a fair amount. Wide receiver alignment is fairly standard, but at least last year, DeBoer sometimes brought his receivers in tight to the offensive line. DeBoer’s running game featured inside and outside zone runs, but also more gap runs than IU has used since Wilson left. Specifically, at both EMU and Fresno St., DeBoer used pin-and-pull outside runs and counters. Perhaps the most notable aspect of DeBoer’s rushing attack was his frequent substitution at running back. In the games that I watched, it was not uncommon to see three backs carry the ball in a single drive. And while some of the backs had different skill-sets, this was not a matter of bringing in a certain back specifically on 3rd down or in short-yardage. Whatever the reason, the passing offense at Fresno State was heavy on West Coast concepts and well-orchestrated by McMaryion, who was decisive and accurate. Running backs were frequently targeted and not just as check-downs, but on angle and wheel routes where the play was clearly designed with the back as the primary receiver. Screens were also common, both to the backs and to receivers on bubble and tunnel screens. One of Coach Wilson’s old favorites, the fake bubble screen deep ball was used more than once. Tight ends were also frequently targeted on short routes between the hashes and on intermediate throws down the seam. Fresno State had a stud receiver, KeeSean Johnson, who regularly got open on curls and outs, which then set up double-move deep throws. This wasn’t an offense that threw the ball deep all the time, but it wasn’t all dink-and-dunk short passing either. When Fresno State went deep, it was very rarely a straight vertical route to an outside receiver. [ref] AKA the Coach DeBord “my boss is telling me I have to throw it deep so I will call the most vanilla, least efficient or creative deep pass I can come up with” Play. [/ref] Instead, it was more often a deep pass off of another play, be it a fake screen, an RB wheel or a double-move by a wideout. There were also deep posts to the middle of the field, generally off play-action. DeBoer’s EMU offenses were not quite as dynamic. The main thing that stuck out to me was the heavy use of tight ends. In the two games that I watched, I would say that EMU’s tight ends were targeted as much or more than the receivers. On the RPO[ref] Run-pass option, in case you haven’t watched college football on TV in the past few years, where every color commentator has to prove his intelligence by talking at length about RPOs. [/ref] front, DeBoer doesn’t seem to use them too much. I noticed the standard bubble screen on the backside of a zone read, but hardly anything else beyond that. It is not surprising that DeBoer’s 2018 Fresno offense was strong in the red zone, given the strong running game, the diversity of possible targets, and the emphasis on timing in the passing game. In 2018, the Bulldogs were 8th in the country in red zone score %, at 91.2% and were 13th in red zone TD % at 73.7%. In 2017, those rankings were 32nd and 96th. In the two 2018 games I watched, it was obvious that DeBoer wanted to get the ball to KeeSean Johnson or his best tight end target in the red zone, and that strategy normally paid off for him. In terms of overall game management, and assuming this came from DeBoer and not the head coach, I did not notice anything out of the ordinary. When his teams had the lead, DeBoer was more than willing to keep the ball on the ground, which I suspect Coach Allen will enjoy. I didn’t see anything to indicate that DeBoer is a huge risk taker. He would prefer that his offense stay on schedule, with the occasionally deep shot mixed in. I only saw one true trick play in the five games I watched – an odd, fumble-rooski-type play in one of the EMU games – so he doesn’t seem to have Jeff Brohm’s love of trickeration. In Part 2, coming later this week, we’ll analyze how IU’s current personnel fits DeBoer’s scheme.